Fire Emblem: Heroes – Arena | TCG, shiyo? I’ve usually been able to make it into Tier 20 of Arena, but never come anywhere close to staying in. However, this week, for the first time I’m likely going to fall down to Tier 18. This is likely due to things like the weapon upgrades, which I don’t currently make use of. Another contributing factor is my unit choice, with two Cavalry and a Singer. I’ve gotten away with this up until now, but maybe not any longer. My Arena team usually consists of Reinhardt, Xander, Azura and a bonus unit. Winning maps is usually easy, but Reinhardt’s low stats probably bring my score down. As a first step to sorting out my team, I need to work out how much my current members are worth, and if there’s a way to improve things on this front. After that, I need to work out if any of my other units could take their place instead and increase my score. Finally, I need to set a plan for increasing my points long-term, and improving other units. My source for SP costs and the scoring formula will be taken from here. I have also discovered this score estimator, which will make things much faster. My current team consists of Xander (695.4), Reinhardt (696.6), Ayra (699.4) and Azura (687.4). Giving me an overall score of 694. It’s clear that Azura is dragging the rest of the team down, since she’s a dancer, and Reinhardt is only up there because of the summoner support, and being a +3. 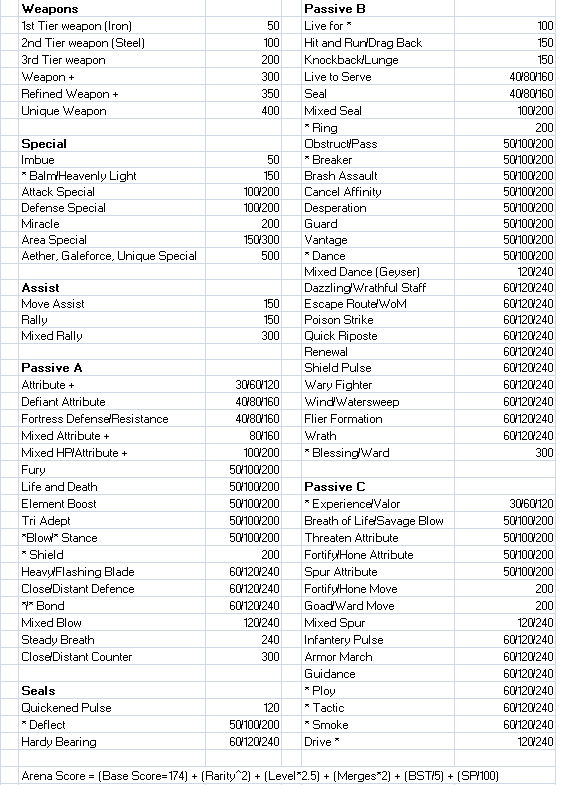 One option to improve this is to change the skills and seals on my units, in order to optimise their value. I could for example, add about 8-9 points to my Reinhardt, and about 2 points overall, without significantly affecting his overall effectiveness in Arena. He would definitely be harder to use though. By comparison, one more merge would add another 4 points to him, and 1 to my team score. This seems like a huge amount of effort, especially since it’ll usually make my units worse in combat. It’s not so bad for Reinhardt, since he already knows a lot of skills, from spending all the excess SP he gains. Everyone else could be a massive pain. The next option is to instead find my best 4 units, and see how this affects my score. The simplest way to handle this is to start working through some of my units based on their BST, or special cases like my 4*+10 Tiki. For now I’ll only work on their current skills, rather than theoretical future builds. This will, for example, exclude double Fury Eldigan. As a base, I assume everyone is equipped with the most valuable Seal possible. This is probably not viable in reality (yet), so I will lose a few points. Notable Seals include: Panic & Attack Ploy, Distance and Close Defence, Guidance, Attack Smoke, and all 3 Deflects. Spurs and Fortifies come a close 2nd. During this process, it became obvious that a lot of my units simply would not be up to scratch yet, and I was able to narrow the selection down to 10 potential units. Nowi (694), Zephiel (697.8), Lucina (699.4), Black Knight (704.2), Tiki (706.2), Fjorm (703.8), Brave Ike (707.4), Ephraim (697.6), Olivia (686) and Brave Lyn (694.2). With further work, upgrading weapons and so on, I could see some slight improvements. For example, Tiki can get to 709.2, Ephraim to 699.6 and Olivia to 690.8. In the latter case, if I ever get her to +10, she’ll even reach 706.8. Fortunately for me, the top 4 actually makes a fairly competent team, covering all 3 colours, and with 3 distant counter units. Unfortunately, I missed the end of this current season whilst compiling this article, so haven’t been able to see how it works in practice. My new team would have a score of 705, assuming I equip 4 full strength seals. Tomorrow I’ll get to test this all in reality, so wish me luck!